​Gerald Prout, born on 4 July 1888, was the youngest of the nine children of James Prout and Kate née Cave. Home was Parks farm, rented from the Cliffords' Frampton Court Estate. It was probably through the influence of the squire himself, or maybe other tenants, that both Gerald and an older brother, Howard, enlisted in the Royal Gloucestershire Hussars Yeomanry. Subsequently, Howard, Gerald and another brother, Leonard, all emigrated to Canada; in 1911, Gerald was working as a miller in Kenora, Ontario. He returned to England to visit his family at least once, as he sailed on the Royal George from Bristol on 4 October 1913, bound for Moose Jaw, Saskatchewan. At the beginning of the war Gerald volunteered for the Canadian Mounted Rifles, but was discharged owing to a medical condition. 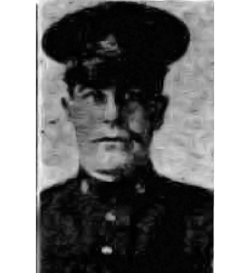 However, he seemed determined to serve for, after an operation and whilst working at the Lake of the Woods Milling Company in Keewatin, Ontario, he enlisted in the Canadian Infantry on 3 November 1915 at Calgary. On 20 May 1916 he sailed for Europe with the 82nd Battalion of the Canadian Corps on the Empress of Britain, but he was soon transferred to the 54th (Kootenay) Battalion, probably as a replacement for casualties. The men were billeted initially in the town of Albert until, on 13 November, they were moved up into the trenches near Courcelette, which had been the site two months earlier of a bitter battle that had marked the début of the Canadian and New Zealand troops on the Somme. It was on the very next day that Private Gerald Prout lost his life, when an enemy shell landed in his trench. He was first interred behind Regina trench, but in 1920 was re-interred at the Adanac Military Cemetery in Miraumont, along with 18 of his comrades. His ultimate sacrifice is also commemorated both in Frampton, on the war memorial and the village hall plaque, and in Canada, on the Medicine Hat Cenotaph, Alberta, and a plaque in Keewatin commemorating staff of the Lake of the Woods Milling Company.